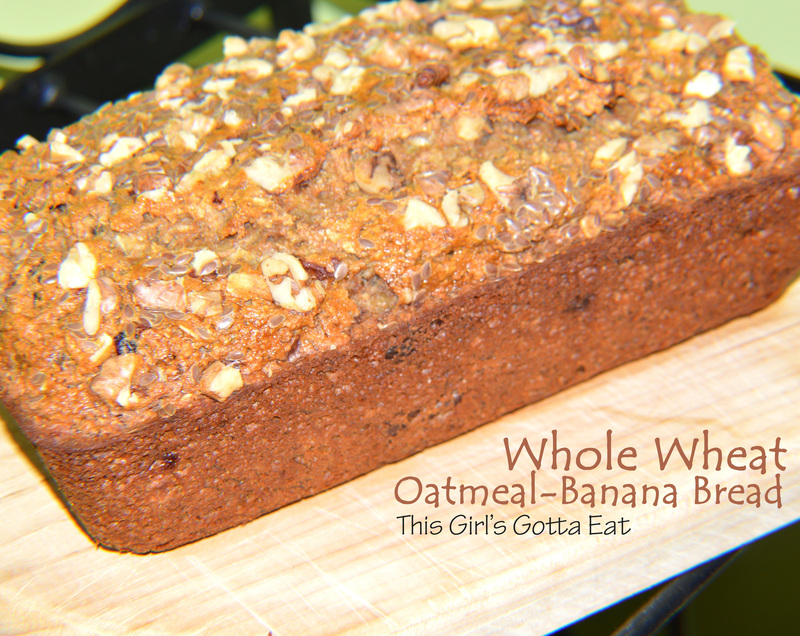 Whole Wheat Oatmeal-Banana Bread | This Girl’s Gotta Eat! I make a lot of banana bread, mostly because I always end up with one or two extremely ripe nanas at the end of the week. I liked the addition of old-fashioned oats in this recipe, which also helps cut down on the flour. Speaking of flour, the organic flour I used came from our CSA Fresh Fork Market share. Yummy! Mash the bananas in a medium bowl. Stir in egg, milk, honey and vanilla. Mix the banana mixture into the flour mixture just until combined. Fold in the cranberries and walnuts. Lightly spray a loaf pan with nonstick spray. Pour batter into the loaf pan, then top with more walnuts and flaxseed. Bake for 50-60 minutes. Bread will be done when you insert a toothpick into the center and it comes out clean. Slice and enjoy with a butter of your choice!